Ortberg in my opinion is a fantastic writer. 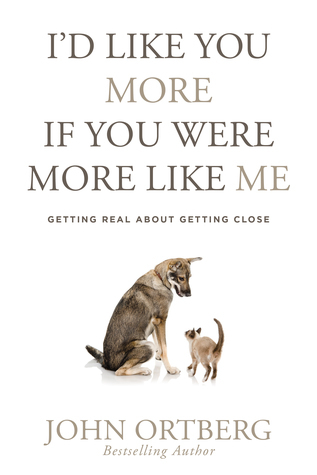 In "I'd Like You More if You were More Like Me," he writes with intentionality about how we are all hard wired for deep connections with God and with one another. I can't express how much I enjoyed this book. We are all created uniquely different, but we can all benefit from one another's differences. This book is about getting close with your co-workers, spouse, children, family and church members despite how difficult it may be. Despite how difficult these hard wire connections may be, we were created for them and with God. Based on God's truth through scripture, personal experience and psychology, Ortberg draws from several avenues to bring his point across. You will find this book fascinating and you'll leave with a deeper appreciation of how you were created. I really enjoyed this book and felt that it made me learn more about people rather than myself. I highly recommend this book. I give this book 5/5 stars. A favorable review was not required. If you want to dig deeper, be more connected with God, understand why you were created for relationships and figure out how to handle differences, this book is for you!